This is the first in an occasional series covering really excellent ways to make simple core ingredients. 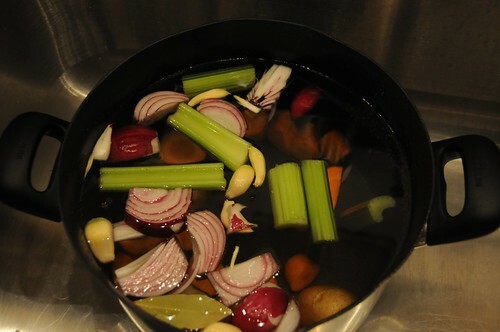 This week: vegetable stock. As most people who have cooked for vegetarians can attest, store-bought vegetable stocks vary widely in taste, and only a few are palatable to me. In some cases, like strongly flavored soups, the precise taste isn’t so important, but dishes like risotto, the taste of the broth can really dominate the dish. Which brings us to the much-vaunted solution: make your own! I have two pieces of good news about this. The first is that making stock is as easy as throwing some stuff in a pot with a lot of water, bringing it to a boil, and waiting. The second is that pretty much anything you make is going to be better than store-bought stock, so experimenting is pretty painless. Aromatics: Peeled garlic cloves are a great addition, and a bay leaf is practically mandatory. Parsley is common, as are whole peppercorns and thyme. Salt: You need some! You can use anything you have on hand, or try soy sauce. Extras: White wine is perhaps the most common addition to vegetable stock. You can also use a splash of fruit juice (try apple cider!) for a slightly sweet stock that would be good in squash soup. Look out for: Brassica vegetables (cabbage, broccoli, and cauliflower) often taste overwhelmingly strong. Use tomatoes in moderation, as they have a strong flavor too. Beets will make your stock pink. Using herbs with a particular flavor palette is fine, but remember to label your stock with this so you don’t use something heavy on Italian herbs to make a Japanese soup! Roughly chop the vegetables: quartering them is fine! Heat it to a boil, then lower the heat until it’s simmering. Leave the top off. Simmer for about an hour. You can strain the stock at this point with a colander and store it in the fridge or freezer, or you can continue to simmer it until it reduces significantly — I usually aim for about an eighth of the original volume — and then cool it and freeze it in ice cube trays. 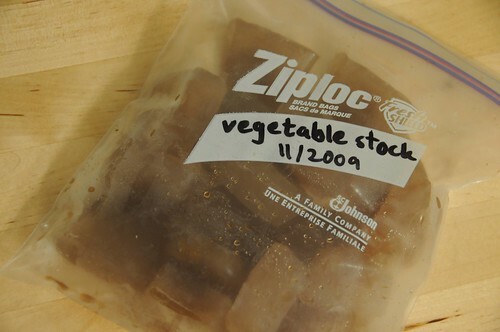 Once it’s fully frozen, you can pop it out and throw the cubes into bags for later use. Note how concentrated it is so you know how much water to add when you use it! 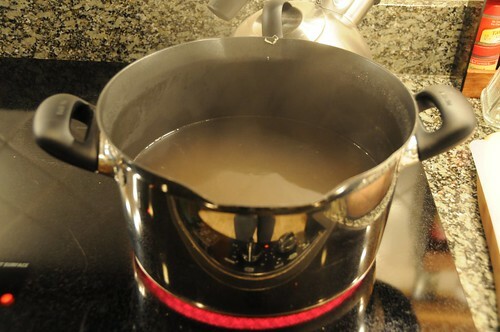 Stock will keep a few days in the fridge; if you need it to keep longer, pour it out into a pot, boil it for 10 minutes, and then put it back in the fridge. It will keep forever in the freezer, but will taste best in the first two or three months. One of my stock tricks is to freeze the ends and peelings of vegetable that I chop up, and to make stock when I have enough vegetable bits saved up. I’ve learned that I have to be judicious over what I’m saving and using though, for exactly the reasons you stated in your post. Some veggies, and particularly the peels, can have a strong or bitter flavour. Also, I’d only do this with organic veggies. The flavour is better. Plus I’m not sure that concentrating any pesticide residue from conventionally-farmed veggies would be a good idea! I also like to save rinds from cheese (especially gruyere) in the freezer to toss into stocks. Love the freezing tip! I got some Himalayan sea salt and whole peppercorns this Christmas from Sustainable Sourcing https://secure.sustainablesourcing.com and I think I’ll have to use them in some stock. Thanks for the post! @Amanda – I’m going to start a bag in my freezer soon! @Rosa – ooh, good idea. I put cheese rinds directly in soup, but didn’t think to use them in the stock!